SACRAMENTO, Calif. (AP) — A 38-year-old man on probation for a gun crime has been accused of killing a sheriff’s deputy and wounding another in a shootout that started with an argument at an auto parts store in the Sacramento area, authorities said Tuesday. Anton Lemon Moore of the city of Rancho Cordova, just outside the capital city, was hospitalized after being shot multiple times during gunbattles with deputies Monday, the sheriff’s department said. Deputies responded to a report of a dispute between a customer and an employee at a Pep Boys in Rancho Cordova in a “routine call” that gave no indication the customer had a gun, Sheriff Scott Jones said. “As soon as they arrived and engaged the subject, he turned as if to run or flee and then immediately turned around and started firing without warning,” the sheriff said. Deputy Mark Stasyuk, 27, was shot in the upper body and killed. Deputy Julie Robertson, 28, was hit in the arm but shot back as the attacker fled. Robertson and a bystander who was hit in the crossfire were released from the hospital Tuesday, sheriff’s Sgt. Shaun Hampton said. Moore, who is also known as Anton Lemon Paris, was taken into custody by other officers after a second shootout, Jones said. Moore pleaded no contest to a misdemeanor charge of carrying a loaded firearm in 2016 and was sentenced to 15 days in jail and three years of probation, according to Sacramento County court records. He was prohibited from possessing a firearm for 10 years. He has faced three other misdemeanor cases since 1998, records show. Moore faced felony charges of assault with a firearm in 2003 but was acquitted by a jury. 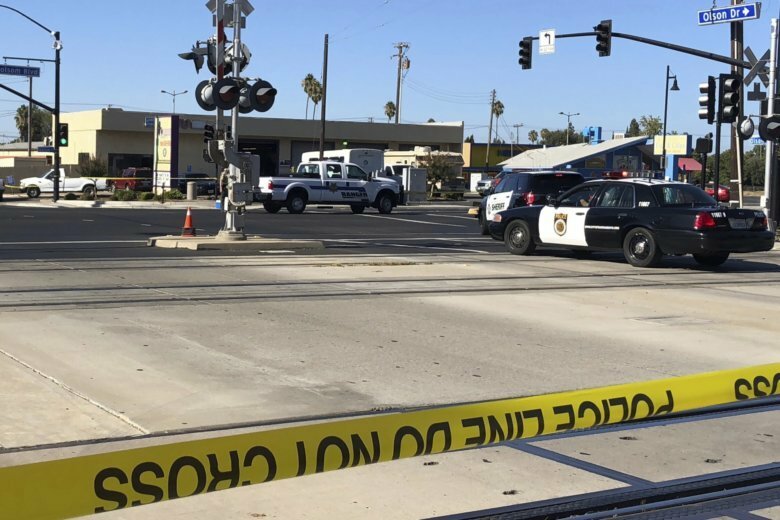 Monday’s shooting was the second fatal incident for the Sacramento County Sheriff’s Department in little more than a year. Deputy Robert French was killed and two California Highway Patrol officers were wounded last August during an investigation into a car theft ring in an unincorporated area outside Sacramento. Stasyuk was a four-year veteran of the department, and Robertson has been with the agency for about three years. Both were assigned to patrol in Rancho Cordova, which contracts with the sheriff’s office for law-enforcement services. “We are very thankful for his sacrifice and very sorrowful for his family,” Mayor Linda Budge said of Stasyuk. Gov. Jerry Brown issued a statement of condolence and said flags at the Capitol would be flown at half-staff in the deputy’s honor.